Düsseldorf, 10 May 2017 – The Düsseldorf-based Druckstudio Group has successfully passed three re-certification audits at once. In addition to the internationally recognised standard for energy management (DIN EN ISO 50001), it was also certified to the revised standards for quality management (DIN EN ISO 9001:2015) and environmental management (DIN EN ISO 14001:2015) in 2017. These certifications provide further proof of the Group’s consistently strong focus on quality and the environmentally friendly and energy-efficient production of its print products. The Druckstudio Group’s quality, environmental and energy management systems were once again re-certified. The preparations for certification were quickly adapted to the revised international standards in Düsseldorf. Certification of quality management to the new ISO 9001:2015 standard in particular entailed significant changes from the “old” ISO 9001:2008 standard. Among other things, risk management and the definition of organisational processes needed to be modified and documented. The revised version of ISO 14001:2015 also resulted in new certification requirements. In this case, for example, continuous optimisation and integration of environmental management into business processes have become more important. During the re-certification process, the auditors were particularly impressed by the company’s constant monitoring of production, services and development in order to further optimise the high-quality, energy-efficient and environmentally friendly production of its print products. “The Druckstudio Group has an exceptionally sophisticated, process-oriented management system,” confirmed DQS certification auditor Dieter Pfaff. “The management team has clearly understood how to make the most out of the added value gained by standardising and optimising processes. The company’s consistent adherence to high quality standards is also impressive. And the level of sustainability that has been achieved here is one of the best I’ve seen in many years in the profession. All of this is down to having a highly motivated and committed team,” he stressed. “The latest re-certification demonstrates that we have maintained a very high standard with the standardisation of processes in the three areas of quality, environmental and energy management and taken this to the next level,” explained Werner Drechsler, Managing Director of the Druckstudio Group. “Our customers benefit from this directly – the results are excellent print quality, sustainable print products, an extremely low complaint rate and maximum flexibility even when time is limited,” he added. 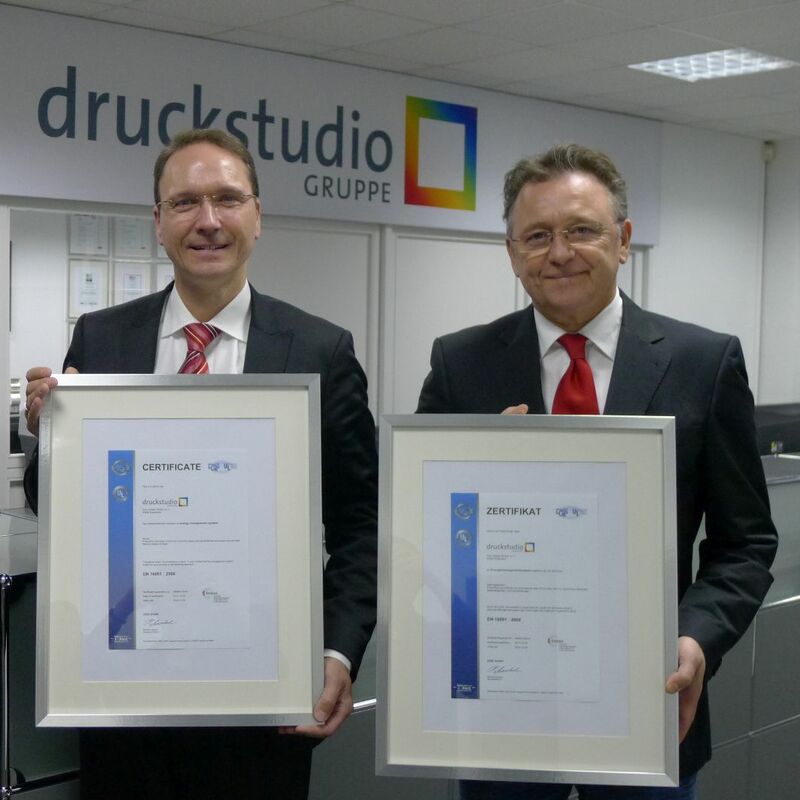 The Druckstudio Group was awarded all three certifications by the independent body DQS GmbH (German society for the certification of quality assurance systems). Founded in 1985 as the first German certification body, DQS GmbH is now a leading international certification company with offices and auditors in 50 countries worldwide.